MuddyWater is a relatively new APT that surfaced in 2017. It has focused mainly on governmental targets in Iraq and Saudi Arabia, according to past telemetry. However, the group behind MuddyWater has been known to target other countries in the Middle East, Europe and the US. 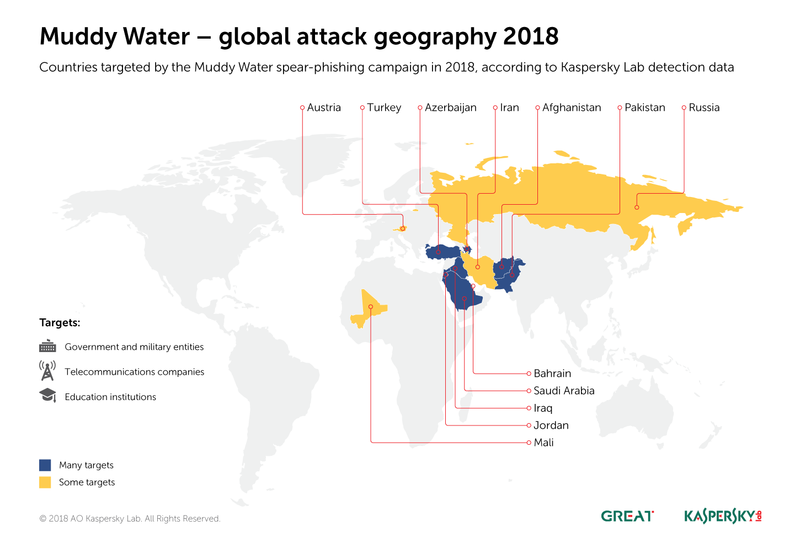 We recently noticed a large amount of spear phishing documents that appear to be targeting government bodies, military entities, telcos and educational institutions in Jordan, Turkey, Azerbaijan and Pakistan, in addition to the continuous targeting of Iraq and Saudi Arabia, other victims were also detected in Mali, Austria, Russia, Iran and Bahrain.. These new documents have appeared throughout 2018 and escalated from May onwards. The attacks are still ongoing. 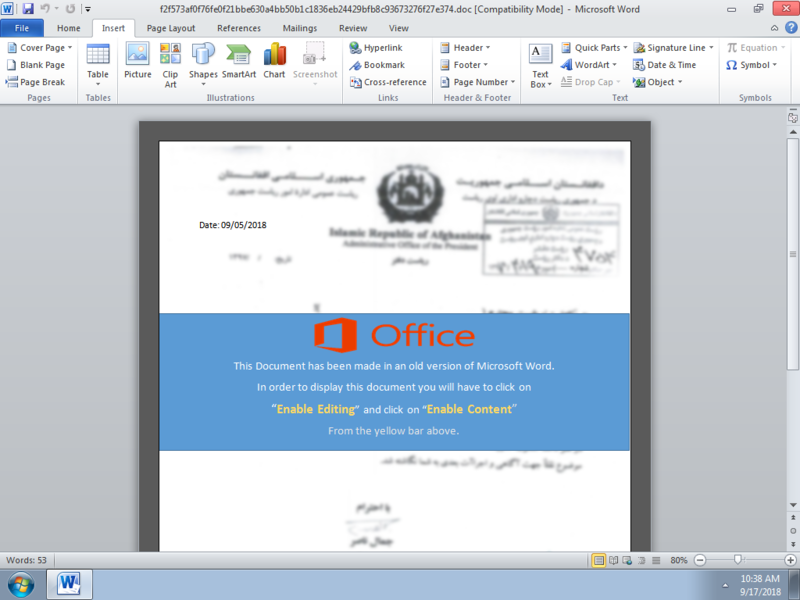 The new spear-phishing docs used by MuddyWater rely on social engineering to persuade users to enable macros. The attackers rely on a range of compromised hosts to deliver their attacks. 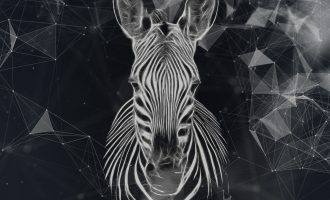 In the advanced stages of this research, we were able not only to observe additional files and tools from the attackers’ arsenal but also some OPSEC mistakes made by the attackers. Below is a description of the malware extraction and execution flow, starting from the initial infection vector, running VBA code via a macro and then dropping the PowerShell code that establishes command-center communications, sends victim system information and then receives commands supported by the malware. 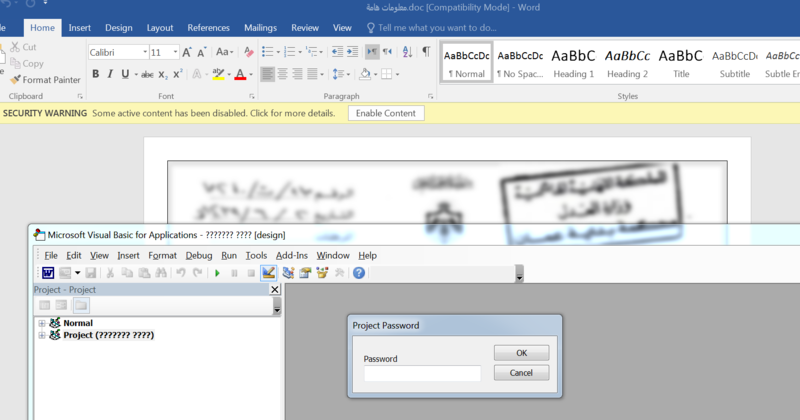 The initial infection starts with macro-enabled Office 97-2003 Word files whose macros are usually password-protected to hinder static analysis. Malicious obfuscated VBA code is executed when the macro is first enabled. 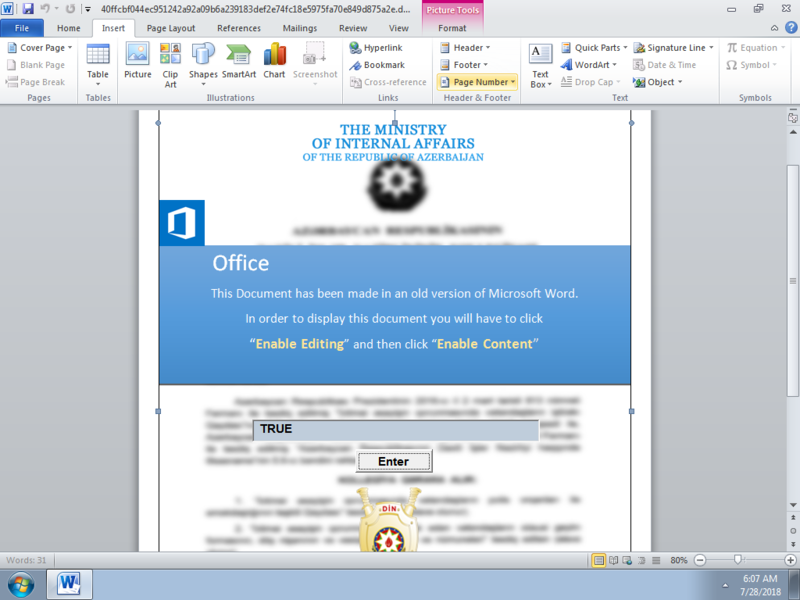 In some cases, the malicious macro is also executed when the user activates a fake text box. Drops two or three files into the “ProgramData” folder. The dropped files are either in the root of the “ProgramData” folder or in a subdirectory. The file names may vary from one version of the malware to another. Adds a registry entry in the current user’s RUN key (HKCU) for later execution when the user next logs in. In some cases, the macro spawns the malicious payload/process instantly without waiting for the next time the user logs in. The registry keys and executables may vary from one version of the malware to another. The next time the user logs in, the dropped payload will be executed. 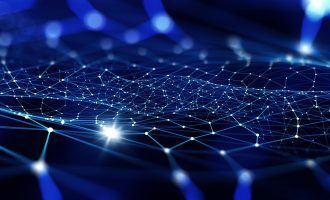 The executables have been chosen specifically for bypassing whitelisting solutions since they are all from Microsoft and very likely whitelisted. Regardless of the file extensions, the files dropped by the macro are EITHER INF, SCT and text files OR VBS and text files. INF is launched via the advpack.dll “LaunchINFSection” function. INF registers the SCT file (scriptlet file) via scrobj.dll (Microsoft Scriptlet library). The VBS file decodes itself and calls mshta.exe, passing on one line of VBScript code to it, which in turn spawns a PowerShell one-liner which finally consumes the text file (usually Base64-encoded text). When PowerShell is invoked whether via WMI, wscript.exe, or mshta.exe, it executes a one-liner PowerShell code (as outlined above) that reads the encoded text file dropped in ProgramData and then decodes it. The resulting code has multiple layers of obfuscation. The first thing the PowerShell code does is to disable office “Macro Warnings” and “Protected View“. This is to ensure future attacks don’t require user interaction. 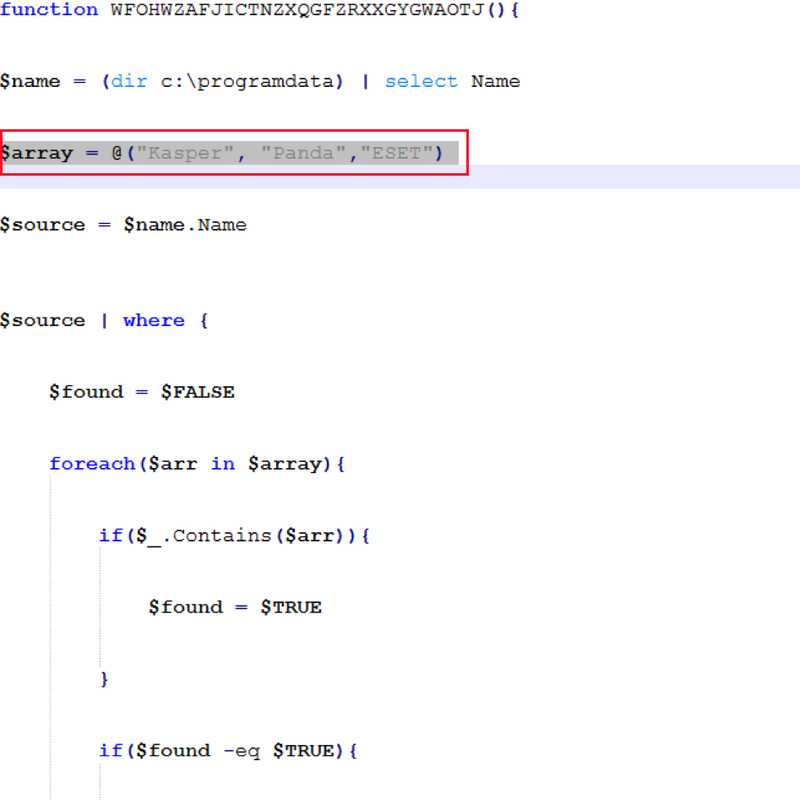 It also allows macro code to access internal VBA objects for stealthier macro code execution in future attacks. Next, it checks the running processes against a list of hard-coded process names; if any are found, the machine is forcefully rebooted. The names are linked to various tools used by malware researchers. In some cases, it calculates the checksum of each running process name, and if it matches any hard-coded checksums, it causes a BSOD via the ntdll.dll “NtRaiseHardError” function. A URL is selected at random from a long list of embedded URLs held in an array named $dragon_middle. The selected URL is subsequently used for communication with the CnC server. If it can’t send data to the chosen CnC URL, it tries to obtain another random URL from $middle_dragon, then sleeps from one to 30 seconds and loops again. The code then tries to obtain the victim’s public IP via “https://api.ipify.org/”. The public IP is then POSTed along with OS Version, Internal IP, Machine Name, Domain Name, UserName after being encrypted to the previously chosen URL to register a new victim. This allows the attackers to accept or reject victims depending on their IPs, countries, geolocations, target enterprises, etc. Depending on the response from the attacker’s CnC, the victim is assigned an ID $sysid. This ID is sent to the CnC with each request for commands to execute. “upload“, “screenshot“, “Excel“, “Outlook“, “risk“, “reboot“, “shutdown“, “clean“. These commands vary from one version to another. The “screenshot” command takes a screenshot that is saved as a.PNG file in “ProgramData“. The “Excel” command receives another stage of the PowerShell code, saves it in “c:\programdata\a.ps1” and then asks Excel to execute this PowerShell script via DDE. The “Outlook” command receives another stage of the PowerShell code, saves it in “c:\programdata\a.ps1” and then asks Outlook via COM, via MSHTA.exe, to execute it. The “risk” command receives another stage of the PowerShell code, saves it in “c:\programdata\a.ps1” and then asks Explorer.exe via COM interaction to execute it. The “upload” command downloads files from the CnC and saves them locally in “C:\ProgramData“. The “clean” command destroys the victim’s disk drives C, D, E, F and then reboots. The “reboot” and “shutdown” commands immediately reboot and shut down the victim’s machine. 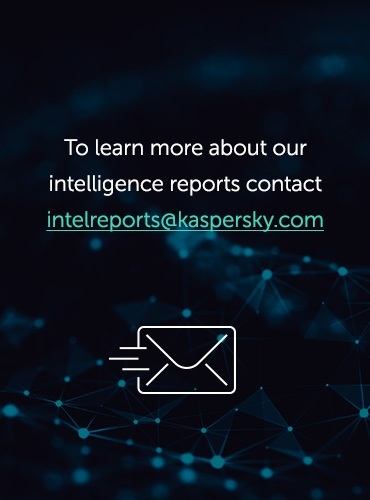 In one version of the malware, the code checks if the “ProgramData” folder has folders or files with the keywords “Kasper“, “Panda“, or “ESET“. Most victims of MuddyWater were found in Jordan, Turkey, Iraq, Pakistan, Saudi Arabia, Afghanistan and Azerbaijan. Other victims were also recorded in Russia, Iran, Bahrain, Austria and Mali. 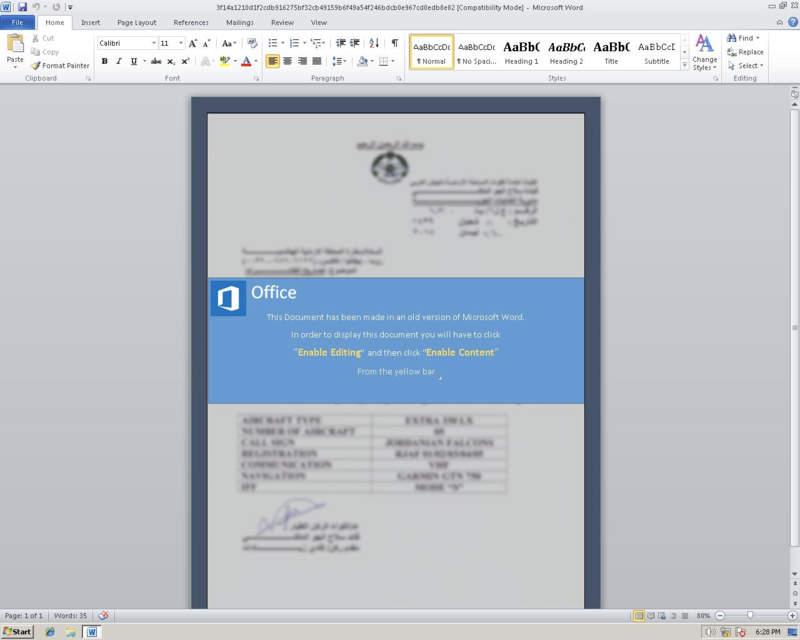 The malicious decoy documents used in the attacks suggest they are geopolitically motivated, targeting sensitive personnel and organizations. Leo, Poopak, Vendetta and Turk are the usernames of those creating the documents or the templates on which they are based. Turk could point to a person of Turkish origin. Poopak is a Persian girl’s name or might suggest the authors are not entirely happy with “Pak”, which could be short for Pakistan. Leo could be one of the attacker’s names. We also don’t rule out the possibility of false flags, with the attackers using random usernames to confuse researchers. In multiple instances, we have also found Chinese text inside the samples, possibly indicating the reuse of code by the attackers. We have also noticed that for some samples, e.g. 5a42a712e3b3cfa1db32d9e3d832f8f1, the PowerShell code had only three CnC URLs, which leads us to believe that most of the CnC URLs in $dragon_middle found in other samples could actually be ‘noise’ to distract researchers or trigger false positives. Effective protection from targeted attacks focuses on advanced detective, preventive and investigative capabilities via solutions and training, allowing an organization to control any activities on their network or suspicious files on user systems. The best way to prevent attackers from finding and leveraging security holes, is to eliminate the holes altogether, including those related to improper system configurations or errors in proprietary applications. Organizations are also recommended to implement the following steps for an enhanced level of protection at their premises. Use PowerShell Constrained Language Mode as it uses IEX, Add-Type, and New-Object. Lock PowerShell Execution Policy, must be set to “AllSigned” via GPO. A whitelisting solution to prevent certain process child-parent execution hierarchies. 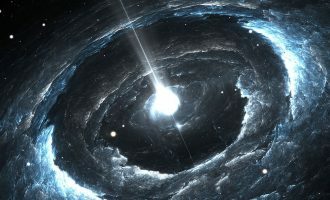 The MuddyWaters group has carried out a large number of attacks and demonstrated advanced social engineering, in addition to the active development of attacks, infrastructure and the use of new methods and techniques. The attackers are actively improving their toolkit in an effort to minimize their exposure to security products and services. 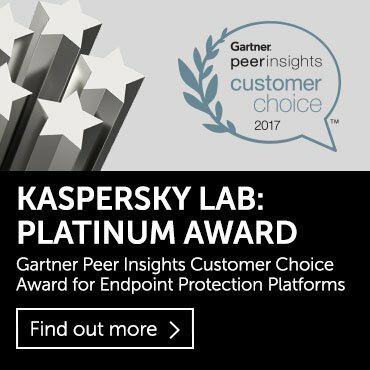 Kaspersky Lab expects these types of attacks to intensify in the near future. Educate generic staff to be able to distinguish malicious behavior like phishing links. Educate information security staff to have full configuration, investigative and hunting abilities. Provide security staff with access to the latest threat intelligence data, which will arm them with helpful tools for targeted attack prevention and discovery, such as indicators of compromise and YARA rules. Make sure enterprise-grade patch management processes are well established and executed. 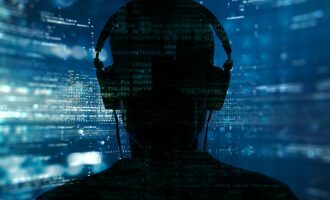 High-profile organizations should have elevated levels of cybersecurity, attacks against them are inevitable and are unlikely to ever cease. In the advanced stages of this research, we were able not only to observe additional files and tools from the attackers’ arsenal but also some OPSEC mistakes made by the attackers.